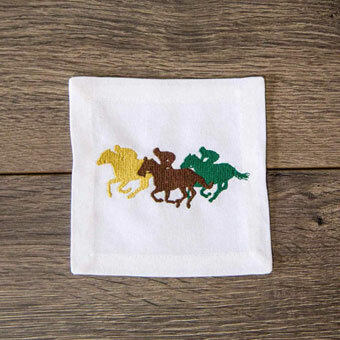 These tri-color Jockey Silhouettes Cocktail Napkins are perfect for racing parties or everyday celebrations. Featuring intricate embroidery in shades of yellow, green and brown on bright white cotton, they look beautiful with our Snaffle Bourbon Glasses. Set of 4 napkins, each measuring 5" x 5".